Viber For PC : How to Downalod and Install Viber on Computer | Viber PC App | Free Pc to Phone Calls, Free Voip Calls to India International ! Why don't we have any official Viber for PC application yet. Why is there any need for such tutorial on Viber PC application. These questions certainly need to be answered by the Viber team. We talked about their mobile voip application for iPhone, how you can use Viber to make free mobile calls. Since it has only launched its iPhone application, Android Application and Blackberry App (with some limited features), the wait for viber app for computer is getting longer! But what about those not having a smartphone, but still want to talk to their friends (on their iPhone) using Viber. I think it should soon launch their PC app. Please share your views on this. Do you really require Viber PC application or are you satisfied using viber only on your mobile! Also a lot of people while on their computer, want to access everything from pc only. Who doesn't like to do the job of mobile from their laptop itself (off course vice versa is also true). I guess Viber should soon officially launch its PC application. But till the time it launches its official app for PC, lets see a way by which you can use Viber on your PC. Viber has launched its Android app as well, however its computer application is still not officially out. Viber people keep on saying that it is still under works and will officially be out very soon. I would rather figure out a way to use Viber on my PC then to wait for it! Before we go into details on how to install viber for pc, lets see how do we get this working in concept. Google Android allows you to run an emulator for PC, which is a simple application running on your PC and the applications works on PC as if its a android mobile. You can run any android application on this emulator. So we are suggesting for now (till viber for pc is officially out) is to install android emulator on PC and run Viber application on this emulator. Google Android account, this is basically an google account (gmail works). Download Java on your computer if not previously installed. Follow this link. Going step by step : Viber for PC requires Viber Android app on emulator, android emulator on PC require java on your computer. Step 2 : Install android emulator. 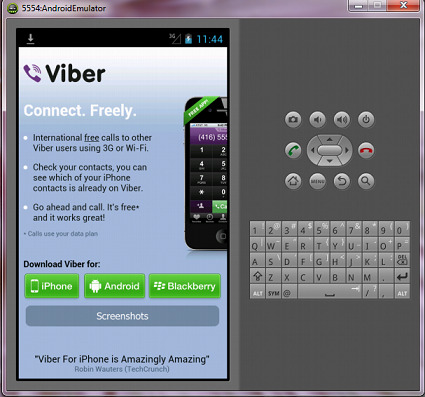 Step 3 : Install Viber apk on Pc using emulator. Before proceeding make sure you have android emulator on PC. Update : Well initially I asked my readers to search on internet installing android emulator on PC. Many people were able to get the android emulator installed on their PC. However they were not able to download Viber android app. So once you have installed android emulator, all you need is Viber Android Apk. Download Viber Android Apk for Free : Download link. Update : Well, a lot of our readers appreciated our efforts when they got this thing installed on PC. However few readers were still finding difficult to install Viber app on their computer. They have asked us several times to post a step by step tutorial ourself. Finally we decided to post the tutorial here itself, with some screenshots (wherever necessary). Make sure Java is installed as explained above. Download Android Emulator and Install this emulator on your PC. Simply download from this link and double click to install it. It will check for which Android OS to install on your PC. Choose the latest "Android 4.1 (API 16)" and click on install package. On the new window that pops up, select accept all and install. It may take some time (about 20 mins, depending on internet speed), so relax while it gets installed! After Android OS emulator has been installed. Click on "Tools" Option, and select "Manage AVDs". A new window will pop up. On the right hand side (as explained in image), click "New". AVD is simply Android Virtual Drive (or android emulator drive on computer). In the target option, select the OS package which we just download. 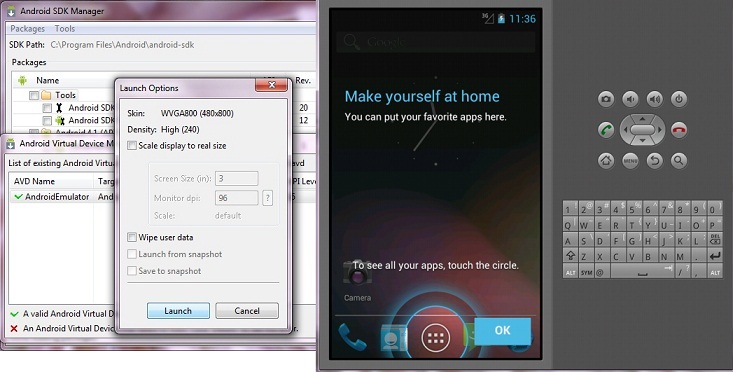 In this case "Android 4.1", select installer package size as "512". Click "Create AVD". Accept everything (ok) in the pop up window. Select AVD Manager and select the AVD which we just created. "Click Start". Click Launch in the pop up window. Android OS will start on your PC. It is much like the android mobile on your computer with screen and keyboard. Enable Wifi : Menu then Settings then Wifi then Enable Wifi. In the android emulator, start browser. Visit www.viber.com. Install the Viber Android App from Viber website. This will install the app on your emulator. Otherwise use above viber apk link to download this app. Once Viber App is installed on your computer, it is simply registering with Viber and verifying your account. Follow the steps as explained below (Verifying Viber PC account). So will the help of above tutorial, I can assume that you have got the viber app installed on your PC. Well if you are still facing any difficulty in downloading and installing viber pc application, then please let us know. We will try our best to help you out! So as to Viber running on PC and start making free calls. Download and install Viber app on PC using android emulator as explained above. When asked for your number, enter your regular mobile number, then confirm. An SMS message with the code will be sent to your mobile phone. Take that code and use it in your viber pc app. Viber will then be activated, and you're good to go. This means that if anyone dials your number on Viber, you will get the call on your PC. Again, If you still face any problem installing Viber on your laptop or your computer, please let us know. We will try our best to help you out. We have tried ourself and both SMS and calling works great! I would appreciate if any Viber official can let us know about the status of their pc app. Lets just hope that Viber PC App is officially out soon. PS : If you are still not able to figure out a way to get this thing working, then don't worry. We have another tutorial (another method) on it. Its a more simple method (tried and tested) to use Viber application on computer. CHECK THIS POST. Don't forget to share this article with your friends (Facebook, Google Plus etc). I'd like Viber on my Mac, so I can answer Viber calls while I'm on my computer. But where is the tip for using Viber on PC? Well, how do we use Viber on a PC? its been more than year now when dude said they should launch viber for pc. where is it? Every signal sent is free to air, Transmiters and receivers.Low power ratio, high transfer, Tesla free, free wiring, the electric universe. Beautiful. 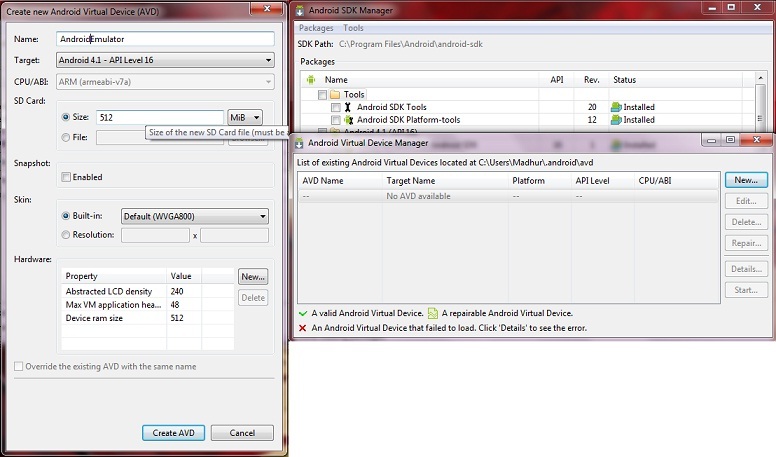 One idea would be to install Android SDK with simulator. Get the viber installed there and try using it. There must be a PC version of Viber. After knowing about Viber benefits, i was also searching viber for my PC. Its good to have PC version, they must do the job to make it possible. Viber Pc version is officially not yet out, however you can follow this tutorial to install viber on Pc. but i download viber app on android emulator on PC by using browser but i can't download. Pls help me !!! how and where can i download viber app on android emulator on PC?? Please. i can't open android market link on android emulator. please give me specific link to get viper software from android market. thanks a lot ! i already download google api from the sdk manager. Hope to get your help soon. Thanks! Are you able to install other apk on android emulator..? Can you please try the apk link we posted. thanks..we have also posted the direct apk download link for viber android. This should help people install viber on PC. Link posted on the blog. Download viber on Pc now! We have posted the direct download link for viber apk. Download it and enjoy viber on PC. If you have ay concerns please let us know. hello sir , thanks for your time to write such a precious article with detailed information , step by step from begining , it takes me long to read it and much more to do it , iam having troubles but google is a good friend , i need to know if you've tried this method and succeeded using viper ? i installed up to SDK PLATFORM OF android 4.0.3. now what after this? After that i tried to create new AVD but its not been possible. Install the android apk as mentioned above! i setup emulator but i can't install viber from my pc to emulator. Unable to install viber on Android emulator, it downloads fine but the error comes up "Application cannot be installed" Tried installing using adb but comes up with this error "Failure [INSTALL_FAILED_MISSING_SHARED_LIBRARY]" Do you know which library is missing or how to fix this issue? Same Here when installed with abd.exe :[INSTALL_FAILED_MISSING_SHARED_LIBRARY]"
and also when downloaded on Android could not be installed! i have downloaded the emulator,but downloading the viber apk is always failing, it doesnt finish it, why??? whats wrong?? it this article true?? i really want to use viber app in my pc. "Well if you are still facing any difficulty in downloading and installing viber pc application, then please let us know." Installed BlueStacks, then installed Viber on Lenova ThinkPad. No problem with sending text, but voice calling does not work. I can call the person with Viber installed on their phone, and I can hear the person on the phone through my PC speakers or a headset plugged into my PC, but they cannot hear me over the headset microphone or the built-in microphone. Audio tests of the hardware shows everything to be OK. Any suggestions? Thanks! i downloaded the and.emu and viber from your link. but how can i install the viber apk from this emu??? Listen bro i have got one problem i can call to someone i can hear their voice but they can't listen to me as microphones of my laptop or my headphones both are useless what should i do? How can people listen to me through emulator (Vibra)? I can not installe the file *.apk in emulator. i can not installs viber apk on emulator, Please help me. Do u have Yahoo or Email. please give me. I made everything step-by-step as described and got [INSTALL_FAILED_MISSING_SHARED_LIBRARY] when trying to install "viber.apk". But by changing the "Target" to "Google APIs (Google Inc.) - API Level 15" in AVD I was able to successfully install viber, tough voice call doesn't work for me, only text messages. "sorry inviber application is not responding on emulator"
"application viber (in process com.viber.voip) is not responding"
Can you please help me? I have installed the emulator, Android 4.0.3 and downloaded viber.apk but when I press on it from the slide down window, it says 'Unfortunately, the process android.process.media has stopped' and wouldn't install. I went to Downloads and clicked install from there, but after a bit it says 'Application not installed' I have been trying again and again for one whole night. Can you help? would you please tell us how to change Target to Google APIs? Thank you. After running Android Virtual Device Manager click on "New" and select the "Target" to "Google APIs (Google Inc.) - API Level 15" in "Create new Android Virtual Device(AVD)" dialog box to create new a new AVD. Start the new one which will help you to install viber.apk successfully. could you pls provide screenshots fro installing apk in emulator. This article couldnt be more step by step. If you dont understand maybe you shoyld wait for the app to be available on pc. Ok..We will try to post some screenshots. Though the link to tutorial we have posted already contains many screenshots. Yes, it worked when I tried it myself. Thanks Bikram for helping other users for installing viber on pc. Can you please confirm if its working as expected or not.. It starts downloading viber from your link but later says 'cannot download. the size of the item cannot be determined'. Whats wrong? We have updated the tutorial with pics. Check that out and follow the steps to install this app. Done! Pictorial Description of Installation steps added. We just checked and it working fine. Sorry guys, We have already posted a detailed step by step tutorial about installing viber on your computer, with snapshots. hi ad, i can't see wifi in setting, can you please show me? scroll your desktop window of your android then you will see your wifi tower. there you can enable your wifi. super long waiting downloading it... hope it worth the wait! even though i successful follow all those steps but can't download the viber app on pc,why?One more thing,i don't have a smart phone. i have installed android 4.1 (API 16) After that i tried to create new AVD but its not been possible. tab of create new AVD is not astivatated.. i m installing it on my laptop....plxxx any1 can help me????? hi. I've installed it and it went great but then when i try to select "menu" to enable wifi nothing happens and the screen on the left is black. can anybody help me please? i have the same problem with them.. i cant download viber , coz the webpage not available might be temporarily down or it may have moved permanently to a new web address..
if you can get it to work, is viber a better quality than skype? can uou please me add me on msn so as to help me? I have the menu.but the words "ANDROID" is on the Left hand pane. I can see the options, and the keyboard, but none of them are responding. i installed the pacakages and created a new emulator but when i open the application i cant press any buttons (menu , or numbers) etc so i cant go to enable wifi and download viber. but i have the viber.apk from another place how do i install it ?? i installed it, but when it is on,in final stage,it doesnt ask me for my mobile number. what to do? how to install viber using windows98se? hi i hav instaaled the program but it is showing as avery small icon like les than the size of a mobile , anybdy knowa how to make its size some more bigger?????????? I have followed all of the above steps and have successfully downloaded Android SDK and Viber on my AVD. But after installation when I open the app it crashes and there's an error saying "Unfortunately Viber has stopped working". How can I fix that? I can`t use buttons in android mode?! How do I Enable Wifi as I am unable to find this, as mentioned above, "Menu then Settings then Wifi then Enable Wifi." I did find the 'Menu' button and the 'System Setting' displayed on the screen but was unable to find 'Wifi'. I have installed Android v4.1 as stated by up in the writeup above. Please let me know what needs to be done to make it functional. I am Arun who had raised a query on March 6, 2013 at 11:30 AM. I request you to kindly send my a reply ASAP. If you are able to see the settings, then you must have been able to see the wifi settings as well. You simply need to enable this. I Installed everything, but when i finally run the program the Android page is opened but nothing happen, I mean, i can not do anything with that. Note that, still i don't install viber.